The Haddon Township theater will take work outdoors, staging the acrobatic show “Barnum” at Wiggins Waterfront Park in Camden from June 21 to June 23. But an outdoor performance isn’t just unusual to the audience. “There’s the constant challenge of the weather, when you’re dealing with costumes and makeup and heat and humidity,” Craig Hutchings of Barrington, a Ritz stagehand and performer, tells the Courier. 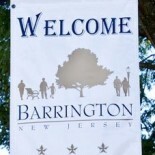 This entry was posted on June 20, 2012 by Barrington Bulletin in Events, Region and tagged performance, ritz.